CSS3 Grid Layout is, as of this writing, still in development. The implementation of CSS3 Grid Layout in the current pre-release is based on the CSS Grid Layout module, which is currently a World Wide Web Consortium (W3C) Working Draft. Because the Grid enables you to align elements into columns and rows but has no content structure, it also enables scenarios that are not possible with HTML tables. By using the Grid in conjunction with media queries, you can enable your layout to seamlessly adapt to changes in device form factor, orientation, available space, and more. Specifies the width of each grid column within the Grid. Each column is delimited using a space. Specifies the height of each grid row within the Grid. Each row is delimited using a space. Column 1 (auto keyword): Column is fitted to the content in the column. Column 2 ("100px"): Column is 100 pixels wide. Column 3 ("1fr"): Column takes up one fraction unit of the remaining space. Column 4 ("2fr"): Column takes up two fraction units of the remaining space. Because there are three total fraction units in this grid, Column 3 is allotted 1 fraction unit divided by 3 fraction units—or 1/3—of the remaining space. Column 4 is allotted 2/3 of the remaining space. Row 1 ("50px"): Row is 50 pixels tall. Row 2 ("5em"): Row is 5 ems tall. Row 3 (auto keyword): Row is fitted to the content in the row. If there are large number of columns or rows that are the same or exhibit a recurring pattern, a repeat syntax can be applied to define the columns or rows in a more compact form. The next two examples are equivalent. There is a single row, and a pattern of repetitive column tracks: a 250px column followed by a 10px gutter. Specifies in which column of the grid to place the Grid item. 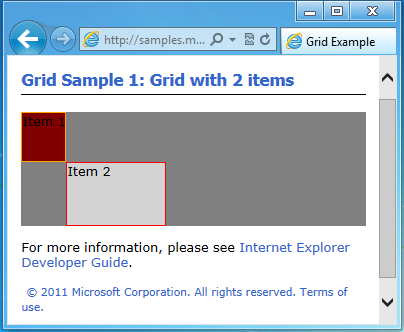 Specifies in which row of the grid to place the Grid item. 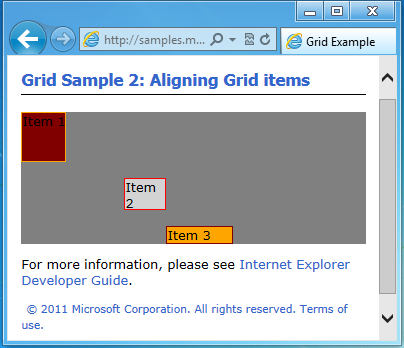 Specifies the horizontal alignment of the Grid item within the Grid column. Possible values are center, end, start, and stretch. 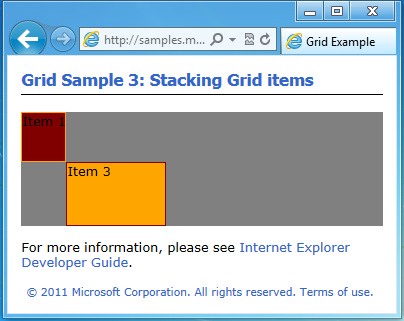 Specifies the vertical alignment of the Grid item within the Grid row. Possible values are center, end, start, and stretch. You can stack Grid items by simply placing them in the same columns or rows. By default, an item that comes later in the markup will be drawn on top of items that come before it. Specifies the layer (z-index) of the Grid item within the Grid cell. While the z-index property normally only applies to objects that have the position property not set to static, the z-index property applies to Grid items even when the position property is set to static. Specifies the number of columns of the Grid that the Grid item spans. Default value is "1". Specifies the number of rows of the Grid that the Grid item spans. Default value is "1". Be aware that if you attempt to span past the number of defined columns or rows in the Grid (for instance, in the previous example, if you leave the value of the -ms-grid-column property as "2" and set the -ms-grid-column-span property to "4", you have exceeded the number of defined columns by 1), another column or row is implicitly created and its width or height is set to auto (fit to content) for every column or row beyond the defined number.